February is the month of romance, love, and St. Valentine (more on him next week). 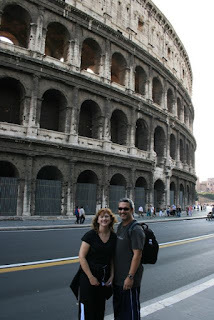 In honor of such romantic pursuits, I am sharing the most romantic travel story I know. Traveling with me is always fun, but this was an exceptional trip. If you missed Part One , you will find it here . Keeping the secret involved distancing myself from Kelly as much as possible. I just knew that if we talked I would spill it. I sent emails every few days with trip details and reading suggestions, but every time I emailed Kevin and Brenda, I had to triple check the addresses before I hit “send” for fear that I would accidentally send it to Kelly instead. Kelly and Kevin were on the verge of a major fight about the whole trip. Kelly couldn’t figure out why Kevin just wouldn’t “engage” (to use her word) with the planning. She was royally ticked off, frankly. Finally, R and I arrived in Rome. Kevin and Kelly followed -- sans luggage. We’d concocted a cocktail party to which I had been invited, and without luggage the two love birds did not have clothes to wear at all, much less to a cocktail party. I have never done so much lying in my life. With the wedding coming on Monday, we prayed that Alitalia would find their luggage and deliver it in time. Meanwhile, we traipsed through the Forum and the Campidoglio, stopping each day to buy some underwear… a clean t-shirt… some socks on what was quickly dubbed “The Sweatpants Tour” of Rome. Kelly wanted to back out of the cocktail party. Without luggage, she just didn’t feel like going. Besides she thought it was all about me, so R and I could go, and she and Kevin would just stay home. Kevin was freaking out, too. His suit was in his suitcase along with several other special things he had planned for Kelly. He was on the verge of calling it off. How? Who knew! I just kept lying because someone needed to be calm about it all. We spent the morning of the wedding day at the Vatican Museums . 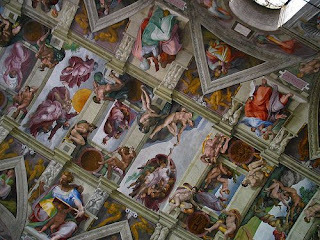 I had a prayerful moment in the Sistine Chapel, begging God to make it all work out ok. I just didn’t want their trip to be ruined by a stupid airline. And then a miracle happened… Kelly’s bag appeared in her room. To be continued... here . Wow! I can't wait for the next installment! AGGH!! I hate it when you leave me hanging! This is totally addicting, and I LOVE it!